When you’re looking for a dealership experience that puts your needs, desires, and budget first—a dealership with a sales team that’s ready to listen—then come to Jay Wolfe Toyota of West County. For years, we’ve been offering Ballwin area drivers high-quality Toyota vehicles along with a customer-friendly approach. We’ve also recently expanded to a state-of-the-art facility with more room for new and used cars and a premium Toyota service center. Over the years, we’ve been the proud recipients of a number of prestigious and exclusive awards, including the Toyota President’s Award, the DealerRater Dealer of the Year Award1, and the Kelley Blue Book Best Resale Value Award2. We’re proud of our accolades, and we’re committed to continuing to deliver the kinds of products and services our customers demand. 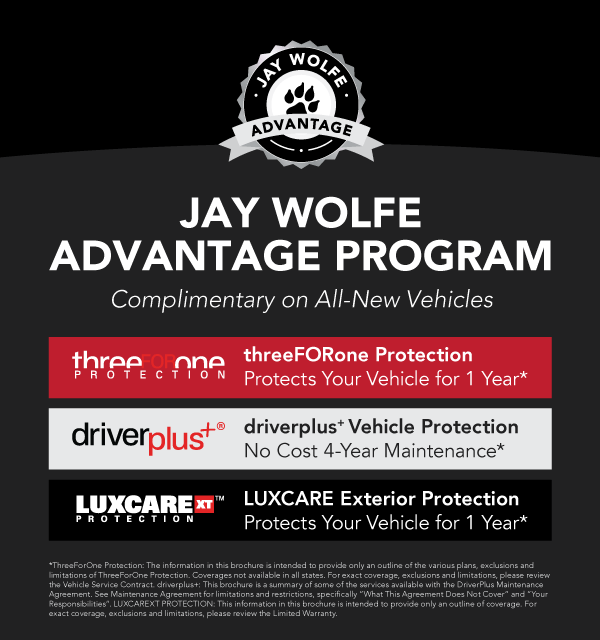 On top of our high-quality selection, we offer the Jay Wolfe Advantage Program. Through this exclusive program, you’ll get four years of maintenance, exterior protection, and first day rental, as well as windshield protection, paintless dent repair, and tire wheel wheel protection. You’re also ensured top-notch maintenance from the Toyota Certified Technicians in our service center, and you can schedule an appointment at any time. If you have questions or want to schedule a test drive, simply contact us online or give us a call at (636) 707-0157. Jay Wolfe Toyota of West County is conveniently located at 14700 Manchester Road in Ballwin, MO, and we’re open every day but Sunday. We look forward to becoming your preferred West County Toyota dealer! Only Toyota dealer around the West County area.Great concierge with food and drink etc..
Walt was so helpful! My car was diagnosed and serviced promptly! I have a 2004 Toyota 4 Runner with 231,000 miles! Still going strong. Thanks for the great service! Pam was able to help us get the service that we needed as quickly and efficiently as possible. Really appreciate her professionalism. Looking forward to working with Pam again. I felt the cost and service was exceptionally good. I was given a loaner car free of cost. So I felt no inconvenience in having my car serviced. Check in and check out was very fast.